Let me begin by saying something nice about Cameron Crowe’s We Bought a Zoo: kids will probably like it. Okay, that’s all I’ve got. 124 min. 20th Century Fox Distribution. Director: Cameron Crowe. Cast: Matt Damon, Colin Ford, Thomas Haden Church, Scarlett Johansson, Patrick Fugit. There’s a meme out there that studies the “Title Drop,” a maligned Hollywood habit of putting the title of a movie into its dialogue. We Bought a Zoo waves that red flag of screenwriting foolishness not once, not twice, but thrice, and from the mouth of a six-year-old babe straight from central casting (add three exclamation points to each line reading). That character immediately evokes Jonathan Lipnicki’s tot from Crowe’s Jerry Maguire: a flagrant plea for “awwws.” We Bought a Zoo is Crowe at his very worst, adapting a true story with little to no regard for the truth, and precise attention to emotional manipulation so gloppy it shorts out the odd moment of genuine sweetness. Nearly everything about the movie is tin-eared, overwritten and overplayed to an annoying degree. 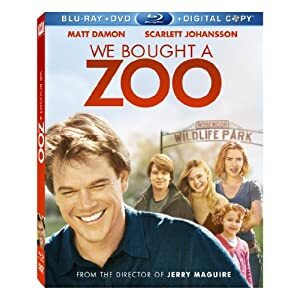 Based on Benjamin Mee’s memoir of the same name, We Bought a Zoo nominally retells how journalist and “adventure addict” Mee (Matt Damon) hauled his family off from the city to an outlying zoo, where they experience a trying and at times comical learning curve on “the business of live animal maintenance.” Just a thought: the arguable glamorization of amateurs becoming part-time caretakers of dangerous animals comes on the heels of the tragedy in Ohio this October, when fifty-six wild animals escaped into populated areas. And Crowe’s movie includes a sequence, played largely for laughs, about an escaped, 650-pound grizzly. Okay, so Mee does inherit the zoo’s professional staff when he buys the money pit, but they’re walking stereotypes: the hot zookeeper (Scarlett Johannson), there to be widower Mee’s love interest rather than her own person; her twelve-year-old niece (Elle Fanning), there to be love interest to Mee’s fourteen-year-old son (Colin Ford); the blasé young zookeeper (Patrick Fugit of Almost Famous) ever with a monkey on his shoulder; and the hard-drinking Scottish zookeeper, an outright cartoon character played as such by Angus Macfadyen. Working hard to be the saving grace, Thomas Haden Church genuinely amuses as Mee’s brother. If you have a high tolerance for cutesy, feel-good pap, We Bought a Zoo slickly fills the bill. Yes, the British story has been expediently Americanized and rewritten for maximum tear-jerkage. Yes, it lazily uses wall-too-wall popular music to make emotional appeals. Yes, it’s corny in the extreme and lets JB Smoove devour the scenery as a real estate agent. And yes the script-y dialogue would be laughed out of the room by the average film student (samples: Mee asks his daughter, “Am I doing anything right?” and his textbook-surly teen asks, “What is so great about being happy?”). But…but…sorry, that’s all I’ve got. Whatever you think of We Bought a Zoo, Fox opens the gates to its home-video afterlife with glorious A/V virtues in a Blu-ray + DVD + Digital Copy edition. The picture-perfect hi-def transfer goes film-to-digital with brilliant color and finely preserved detail, texture, black level and contrast. There's no hint of digital artifacting to be spotted: this is a warm and film-like presentation. The lossless DTS-HD Master Audio 5.1 surround mix is likewise above reproach. The frequent music cues get a full-bodied treatment, dialogue is crystal clear, and surround design is impeccable, crucial to the illusion of being in the zoo and immersed in the man-made animal kingdom. Bonus features are surprisingly exhaustive, beginning with an audio commentary by director Cameron Crowe, editor Mark Livolsi, and JB Smoove. Crowe makes for an engaging host, with plenty of background on the film's development and making, and comic Smoove keeps things lively with absurd interjections. Twenty "Deleted & Extended Scenes" (37:27, HD) provide a breadth-taking insight into the editing process, as discussed by Livolsi and Crowe in the commentary. "We Shot a Zoo" (1:15:52, HD) goes into behind-the-scenes depth, with comprehensive cast and crew interviews, set footage, and the complete official story of the film's making. "Their Happy Is Too Loud" (17:29, HD) allows Jonsi of Sigur Ros to detail the composition and recording of his score for the film. Best of set goes to "The Real Mee" (28:35, HD), affording viewers the chance to spend time with the real Benjamin Mee and hear his side of the true story. Also here are a "Gag Reel" (6:57, HD), "Photo Gallery" (HD), and the "Theatrical Trailer" (2:30, HD). All site content © 2000-2019 Peter Canavese. Page generated at 04/18/2019 12:24:28AM.